Good afternoon! I may have several posts over the course of this weekend, but I am not sure of your hours during this holiday weekend. I have attached the following problem that I am stuck on. 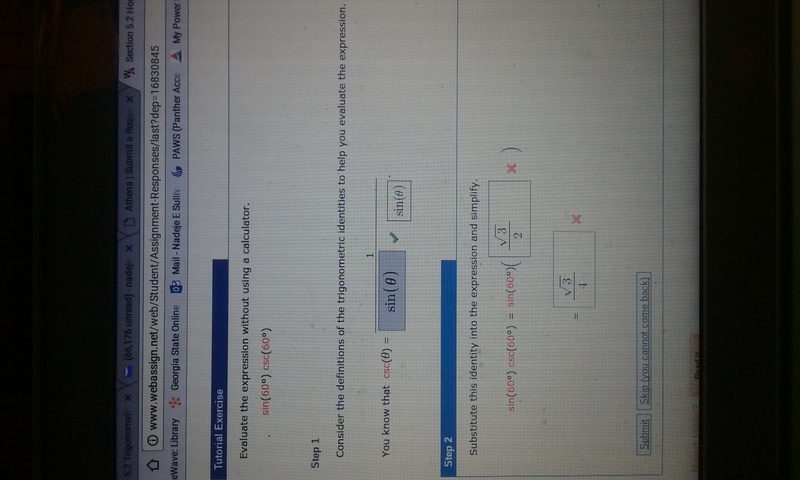 it has several parts, and I thought that it was asking for the literal cos of 60 degrees which I know as 1/2, but I multiplied the two and got the answer below and it is wrong. Please can someone point me in the right direction. Thank you! Sept. 5, 2017, 12:35 p.m. Since you know that the CSC is (1/SIN). That is like asking you is SIN*(1/SIN).